I’m finishing up the discussion (for now) about the Logan Square Arts and Business Center (Logan Square ABC). I’ve had a lot to say about it already because I believe it’s a promising direction for a vital Milwaukee Avenue and Logan Square. While the Logan Square ABC lends legitimacy to the artist tenants, it can also create room to thrive and grow for business tenants. 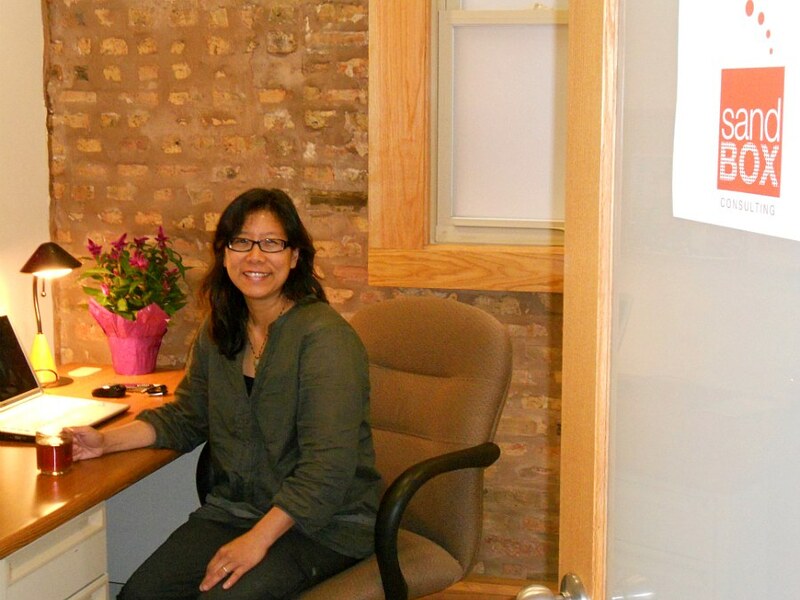 Like so many entrepreneurs, one of the founders of the Logan Square Mompreneurs, Carolyn Ou, started her Sandbox Consulting career and business coaching business from her home. But, as a mom, that quickly meant doing business out of her car! With two kids at home, the car was often the only place she could find the quiet to coach her clients by phone. Even when there was relative quiet on the home front, Carolyn found it difficult to separate home and work life. If you want to encourage the numerous neighborhood gifts of art as Godin defines it (see Gifts make the neighborhood), let the artist know how you appreciate the gift, how it changed you, how it moved you to action. Thank you Dunlays on the Square for your dedication to your neighborhood clientele, and I’ve introduced you to people from outside the neighborhood and even from out of town. Thank you Logan Square Chamber of Commerce and all the volunteers who created the Logan Square Farmers Market; I so enjoy it as a great community gathering space. Thank you Logan Square Neighborhood Association and the intergenerational volunteers that created Cuentos en la Pared/Stories on the Wall (the blue and yellow mural at the Logan Square “el” stop); it brightens my day whenever I see it. Thank you Café con Leche for creating such a warm and inviting addition, and I continue to let people know about it. What have you been meaning to say? Copy, paste and fill in the blank with a comment: Thank you, and _____. 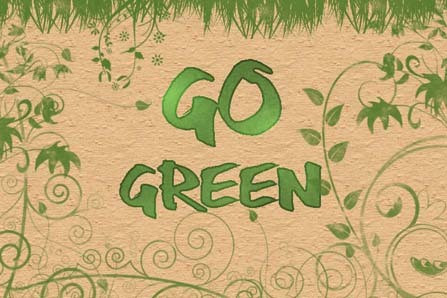 3030 W. Fullerton Ave.; first of four sessions providing practical information on energy efficiency upgrades; RSVP requested (email greenideas at loganchamber dot-org). Logan Square Literary Review: read it! write for it! 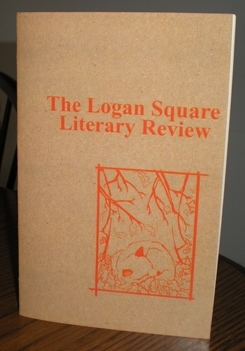 The inaugural issue of the Logan Square Literary Review (LSLR) is now available at these fine Logan Square establishments: Wolfbait & B-girls at 3131 W. Logan Boulevard and G-Mart Comic Books at 2641 N. Kedzie Avenue. Logan Square Farmers Market opens its 2009 season on Sunday, June 7, 10:00 a.m., and continues Sundays through October, at the southeast corner of Milwaukee Avenue and Logan Boulevard. In addition to the early summer produce from farms like Temple Farm Organics (click for a June coupon), Mike and Clare’s Farm, and Jake’s Country Meats, this week there will be prepared food from Vella Café, Fonda del Mar and Cook au Vin (next week Treat will also join the market). Congrats to New Wave Coffee! Just a couple of weeks ago, the Logan Square Chamber of Commerce named New Wave, with less than five months under its belt, this year’s New Business of the Year. Not only in the White House, but even on and around Milwaukee Avenue there have been some changes. Certainly the above average snowfall this season merits an updated photo (below), though this fails to adequately capture the amount of snow we’ve received thus far.